Description: Thallus cylindrical, olive brown, to 500 mm long. Frond dichotomously or irregularly branched, main axis 2-3 mm wide; generally solid but becoming hollow in older plants; attached by a discoid holdfast. Thallus pseudoparenchymatous with a cortex and medulla developed around a single uniaxial filament which becomes indistinct in older plants. 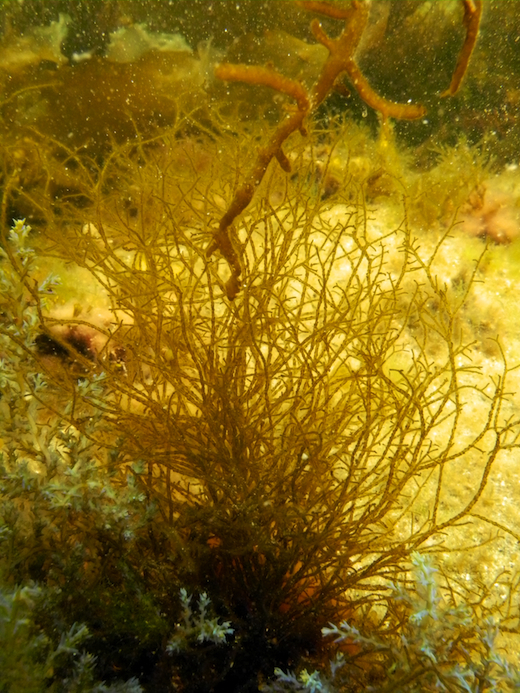 Short unbranched uniseriate assimilatory filaments present at the apices of the frond. Unbranched multicellular paraphyses present. Many discoid chloroplasts per cell. Unilocular and plurilocular sporangia present among paraphyses in sori which are distributed in a spiral or whorled arrangement over the frond; plurilocular sporangia multiseriate. Habitat: Lower intertidal and shallow subtidal; epiphytic and epilithic. Western and southern coasts of Britain and Ireland. Site © M.D. Guiry 2000 - 2019. Important copyright notice: all text, design and photographs on this site are copyrighted by M.D. Guiry unless otherwise stated and all rights are strictly reserved. Click here for copyright information and contact. Website design: 249 Design Studio. Site maintained by M.D. Guiry (michael.guiry@nuigalway.ie). There have been 8736634 page loads since 1 January 2014 on 25 April 2019.